The black and red was striking on this towel. 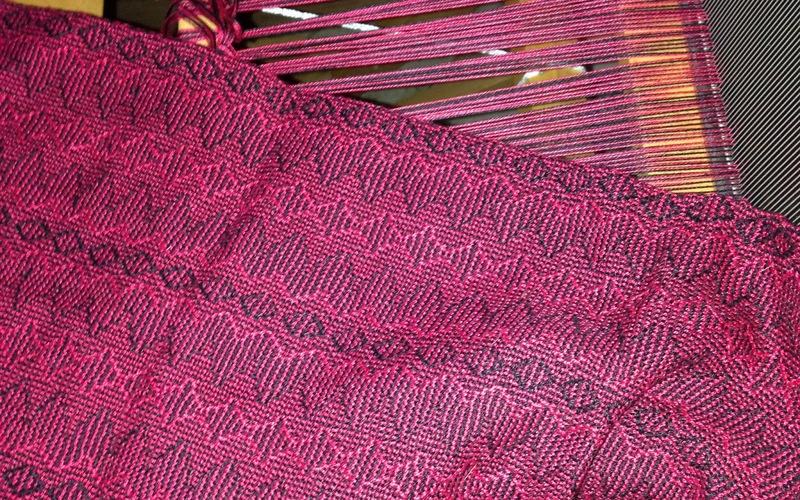 The same colors are still on the loom, but I do not have those colors presently in my reach to weave with. So plan to play with different colors to see different affects. Then I will take it off and put on an entirely different warp (which is the length-wise on fabric and what is on the loom. When I weave, I use a shuttle to weave from selvage to selvage and that is the weft. Side view. To the left is the front of the loom and where I will sit to weave. The beam on back is a sectional warping beam. 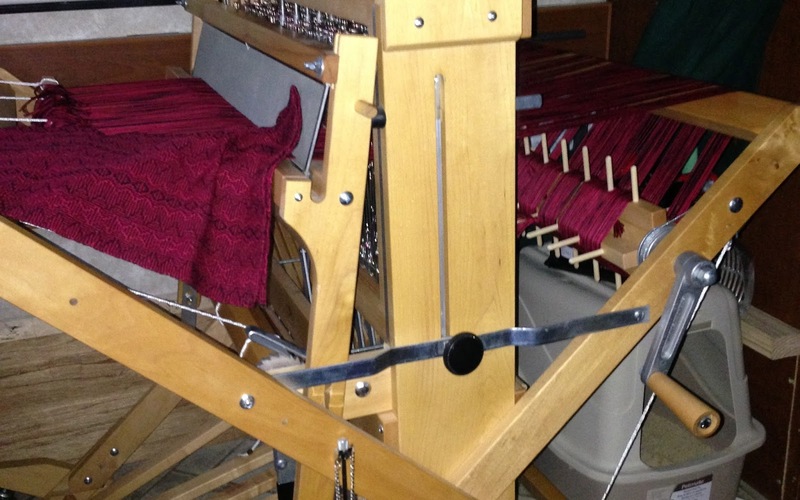 The top of the loom is what is called a “castle”. Not all looms have this feature. Its handy to have tho, as I can keep bobbin winders, sley hooks, tapestry needles, and such up there out of the way. I am so jazzed to have this work. 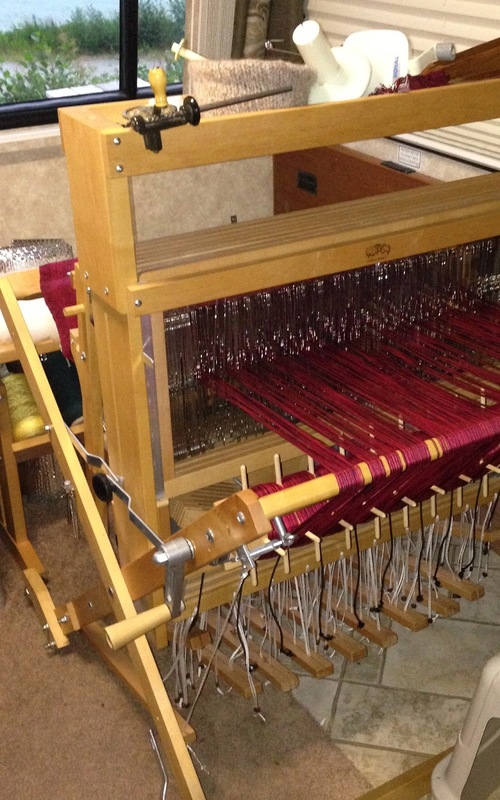 I could not picture it, but glad I stuck it out to decide once and for all when I had the loom inside the rig. My friend Cheri has loaned me a couple of her shuttles, ball winder, bobbin winder to get me thru until I leave, but then I need to come up with them myself. I have a ton of friends and family that have had no idea what I actually do. They have gotten different handwoven items, but to see how things are made – they were clueless. That will all change now. So am wrapping up the last bit of revamping/re-organizing my rig. My friends are having a garage sale on August 3rd – I’ve sure added a bunch of stuff to it. I finished the outside storage bins today, and have almost completed the kitchen. Then I can weave!!! I love it when I discover I have found homes for everything and still have room to spare… Altho I will try to refrain from filling the spaces with yarn… it sure is tempting. Laughing here.